Protea burchellii is a medium-sized, winter-flowering shrub and a delightful addition to any fynbos garden. Burchell's sugarbush is an erect, evergreen shrub, 1-2 x 3 m. Branches are produced from a single stem. Leaves are olive-green with fine black points, linear to narrowly oblong. Flower heads are up to 100 x 70 mm, the flowers are cream-coloured to deep carmine. Fruits with nut seeds, are retained and stored on plants. It is a moderately fast grower, flowering within two years from planting out into correct growing conditions. Flowering time: June to August. Not threatened. Extinct on the Cape Peninsula. 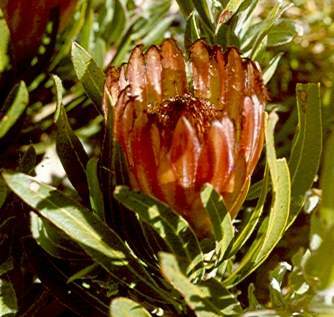 Protea burchellii occurs in varied habitats and seems to prefer rich, well-drained soils, in full sun on the lower mountain slopes at altitudes of 100-850 m. It is found in the Hottentots-Holland to Olifants River Mountains, the Cape to Hopefield Flats, Piketberg and the upper Breede River Valley. 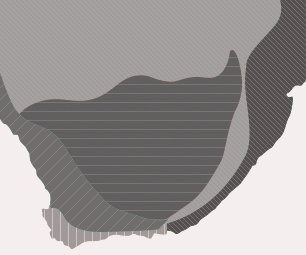 It also occurs in isolated populations at Witzenbergvlakte. The Proteaceae is one of the most prominent flowering plant families. 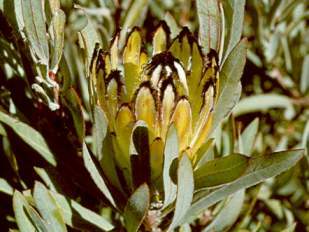 There are about 1400 species, in more than 60 genera such as Protea, Leucadendron, Leucospermum, Serruria and Paranomus. They occur in southern hemisphere countries. Australia has the most with 45 genera, followed by Africa with 14 genera, of which more than 330 species are found in the southwestern Cape. Other countries where they occur include Central and South America, islands east of New Guinea, New Caledonia, Madagascar, Southeast Asia, New Guinea and New Zealand. The family is an ancient one and existed in the time of the dinosaurs. The species vary from groundcovers to trees. This may be the reason behind its original naming by Carl Linnaeus, the father of taxonomy. Proteus was the mythological Greek god who could see the future and always spoke the truth, but in order to extract a prophecy, one had to grasp him tightly while he changed into numerous animate or inanimate forms. Protea burchellii is named after Willian John Burchell, an English explorer and naturalist. Protea burchellii is pollinated by birds. Seeds are retained on plants in seed heads, to be released once dried out and dispersed by wind. 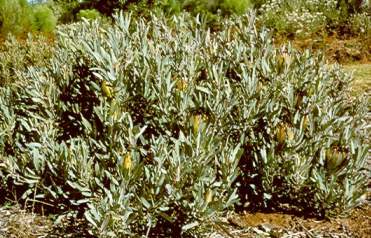 Fynbos is a fire-dependent ecosystem and Burchell's sugarbush has adapted to this. During a fire, the seeds are safe in their seed heads and survive the blaze to replace the mother plants which are killed in the fire. Protea burchellii makes a wonderful garden plant and is used as such for its hardiness. Many hybrid varieties of this species are available. This species and their hybrids are widely used in the cut flower industry. Propagation can be done via cuttings or seed. Seed is recommended as the easiest. Sow seeds in May. Seeds require warm day and cold night temperatures to germinate. Prepare seed trays containing a well-drained fynbos mix of bark, silica sand and loam (25:50:25 mix). Scatter seeds on top and lightly cover with river sand. Water in well and use a fungicide treatment. Keep seed tray moist, not wet. Seed germination varies and will sometimes only germinate the following year. As the first true leaves appear, transplant the seedlings into pots in a well-drained, sandy fynbos mix. Grow on for a year before transplanting into the garden. Take tip cuttings from December to March. Use a rooting hormone and place in a well-drained mix of bark and polyurethane. Cuttings must be kept moist, but not wet. Rooting occurs in approximately five weeks. Harden off rooted cuttings for three weeks and then transplant into pots as for seedlings. In the garden, P. burchellii can be used as filler shrub or specimen stand. With its average height, it makes a good mid-layer planting. Used in conjunction with other fynbos species such as Restio, Buchu and Erica, it makes a lovely display. It can be used in rockeries and open bed plantings. A root pathogen, Phytophtera, is detrimental to Proteaceae. Symptoms include the plant looking wilted and dry followed by yellowing and death. As these symptoms are only seen once the fungus has damaged the plant, the best course of action is to remove the infected plant and burn it, thereafter sterilizing the affected soil with a contact fungicide and refraining from replanting Proteaceae in that area. Germishuizen,G. & Meyer, N.L. (eds). 2003. Plants of southern Africa : an annotated checklist. Strelitzia 14. National Botanical Institute, Pretoria. Rebelo, A. (Tony). 1995. Proteas. A field guide to the proteas of southern Africa, edn 2. Fernwood Press, Vlaeberg, Cape Town.